Whenever you install a card in a server, place 1 power counter on Estelle Moon. trash: Draw 1 card and gain 2credit for each power counter on Estelle Moon. 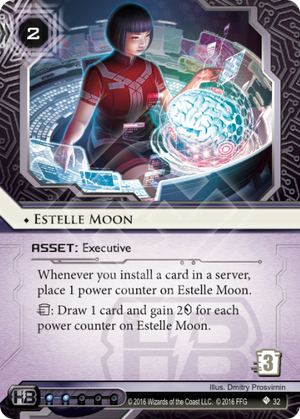 If Estelle Moon has 3 power counters, does the Corp draw 1 card and gain 6 or draw 3 cards and gain 6? As if Asset Spam wasn't a strong enough archetype already, here comes Estelle Moon to give them another boost. Time for hypotheticals. Suppose you install this on your last click. Now the runner can run this and spend a click and 3 credits to trash it, which is a significant investment (unless you're Whizzard: Master Gamer), or they don't check it and you can rez it your next turn. Now you install 3 cards, or 4 if you have Jeeves on the board, and you just gained 6/8 credits and 3/4 cards, all for the cost of 1 card, 2 credits and a click. To add further insult to injury this card can be triggered by simply trashing it. So you can let the runner waste a click by running it, and then trash it to get your cards and credits regardless. And they WILL run this, or they should, because it gets even more bonkers after that. Asset spam often spends 3 clicks installing assets, so that is 3 more cards and 6 more credits for something they were gonna do anyway. The corp now actually risks flooding HQ by drawing too many cards. But they can trigger Estelle any time they want, so I doubt this will be a huge issue. I think this card should not have been printed, and it will definitely increase the amount of HB asset spam decks we see in the meta. Even ID's like Gagarin or Industrial Genomics would consider forking over the influence for this card. And runners might actually want to consider making room for Rumor Mill. Good luck with that.